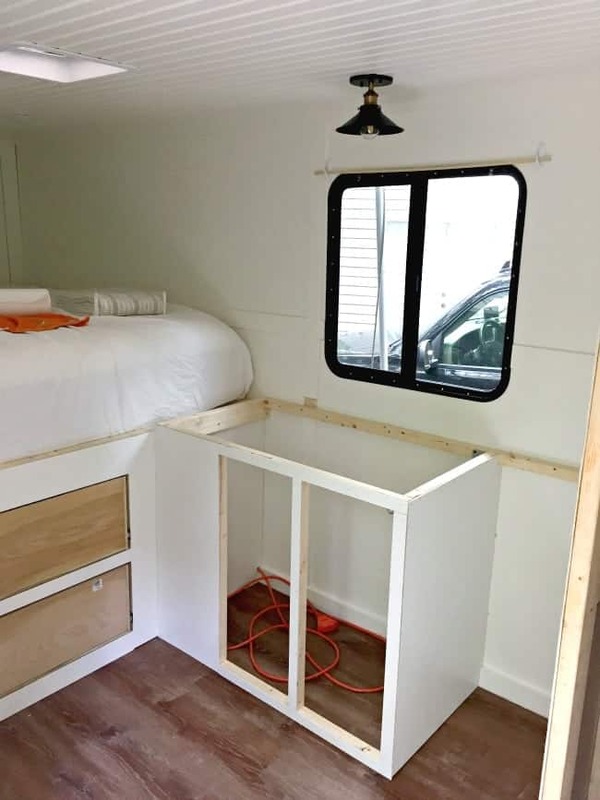 An RV remodel update with a new countertop and kitchen faucet. This is a sponsored post written by me on behalf of Pfister. All opinions are 100% my own. So far we’ve shared updates on the tongue and groove ceiling install, an update on our progress and how we installed vinyl plank flooring. Today, though, is all about our new countertops and faucet, which marks a big milestone in this renovation project. It was a big day in our little RV when we turned on the water for the first time, and it’s been a long time coming. Actually it’s been 7 long and hard months, but all of that hard work is starting to pay off. Now, we may have water but it’s only cold running water (we still need to install a hot water heater). And, even though it was cold, I didn’t let it stop me from using it when we went camping over the Labor Day holiday weekend. I was able to brush my teeth and, yes, I even washed my face. It was so nice to be able to get myself ready in my own space. 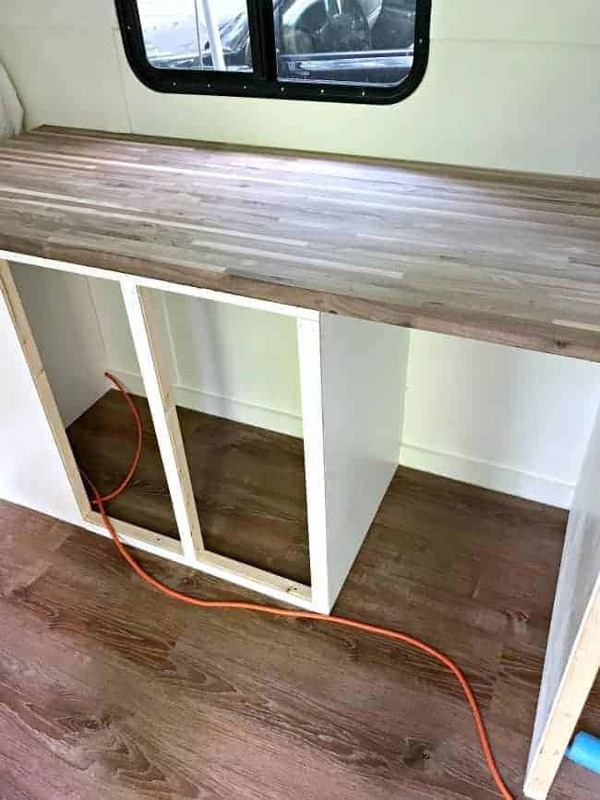 And what kitchen is complete without a kitchen countertop, even if it is a tiny RV kitchen. We went with a walnut butcher block and it turned out better than we’d hoped. We knew early on that we were going to do butcher block for the kitchen. From our research we found that it’s generally less expensive than other types of countertops and it’s easy to cut and fit. Very Important for a project like this. When we found a deeply discounted, and damaged, 12′ piece of walnut butcher block at a local store, we knew it was the perfect piece for Minnie. The idea was to cut off the damaged ends and use the rest for the kitchen counter and drop table. Once we built and framed in the kitchen cabinet, we were able cut and fit our new countertop. When we were confident with the fit, I went to work refinishing it. I researched a lot of options but eventually chose a product called Waterlox, which is a blend of tung oil and resin. It was quite the process to refinish both the countertop and the drop table. It took me almost 2 weeks to complete, and 9 total coats. I’ll have to do another post on the refinishing process. Check out the beautiful finish. I’m thrilled with the way it turned out. 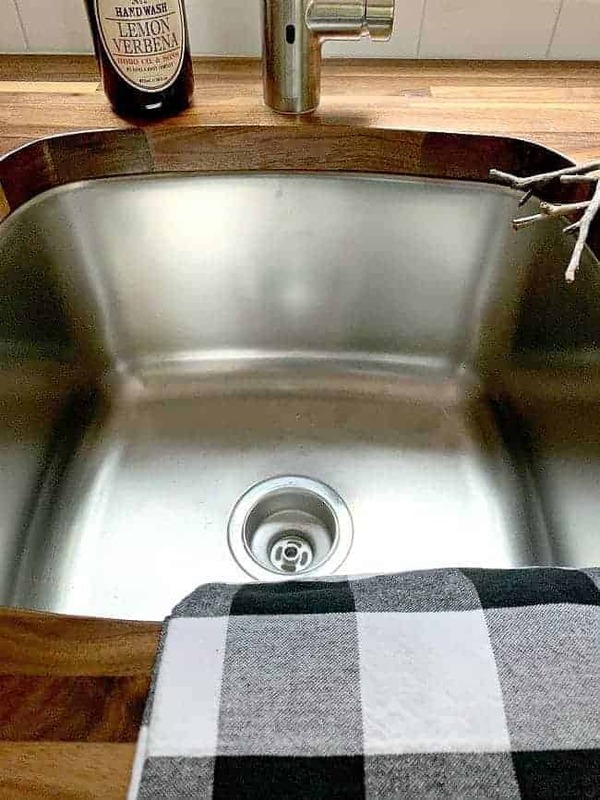 The butcher block countertop may have been an easy choice but the kitchen sink was not. We had a few obstacles to tackle with this project, like the size and placement (on top of the counter or undermount). Luckily, we were able to find a sink that could either be installed under the countertop or on top. Plus it was the perfect size. Since I couldn’t have the ceramic farmhouse sink I wanted, I at least wanted the sink to be mounted under the counter. The hubs, on the other hand, had a different opinion. He wanted to stick with easy and installing the sink on top of the counter is definitely easier. He was nervous about getting a smooth and straight edge on the sink cutout. I finally talked him into giving it a shot, although we only had one shot. In the end it all worked out. The sink fit perfectly and we were able to get a smooth finish on the cutout. The crowning jewel on our new countertop is the new faucet, and I think we found the perfect one. This is my first Pfister faucet and all I can say is…wow. It’s just the right size and I’m loving the pull-down nozzle. The best feature about it though, is that it’s touch-free. It has an electronic sensor that allows you to turn the water on and off with a wave of the hand. It’s really the perfect feature for our RV. On our last camping trip to the beach we didn’t have hookup for sewer, which meant we didn’t have a place to drain our water. When we did use water, the sensor made it so easy to conserve. 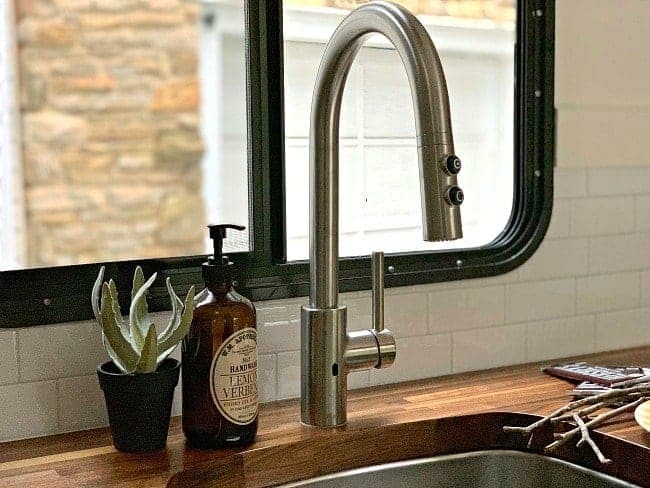 I wasn’t sure how I would like a faucet with an on/off sensor but for us, even in a camper, it just makes sense. I’m so happy with the way the kitchen is shaping up. We still need to finish the walls (more on that later) and make the cabinet doors, but it’s turning into a pretty and functional space. Next up is the bathroom. Our biggest project yet. 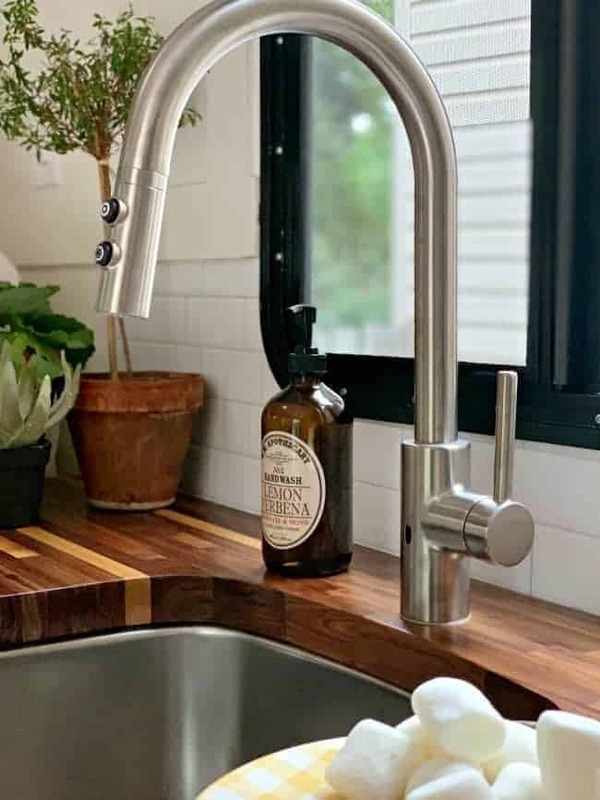 Wow, I love the sink, countertop, and faucet. You and your husband should be so proud of what you’ve done. What a lot of work you have done so far creating a fun space to enjoy for years.Thanks for the sharing this with all of us. Thanks so much Marion! It has been a lot of work but definitely a labor of love. We both can’t wait to take her out once she is done. Wow, really beautiful!! It’s all coming together. Slowly but surely. 😉 Thanks Kim! Love the countertop, (nine coats 🤪 of finish?). And you’re right Minnie is becoming a very pretty little camper! What a lot of work you have done so far creating a fun space to enjoy for years. I know…9 coats. I definitely didn’t plan on that when we picked it out but it’s all good now. I find myself petting them every time I go in there. They really did come out nice. Thanks for checking out our progress and for following along. We appreciate the support and encouragement! 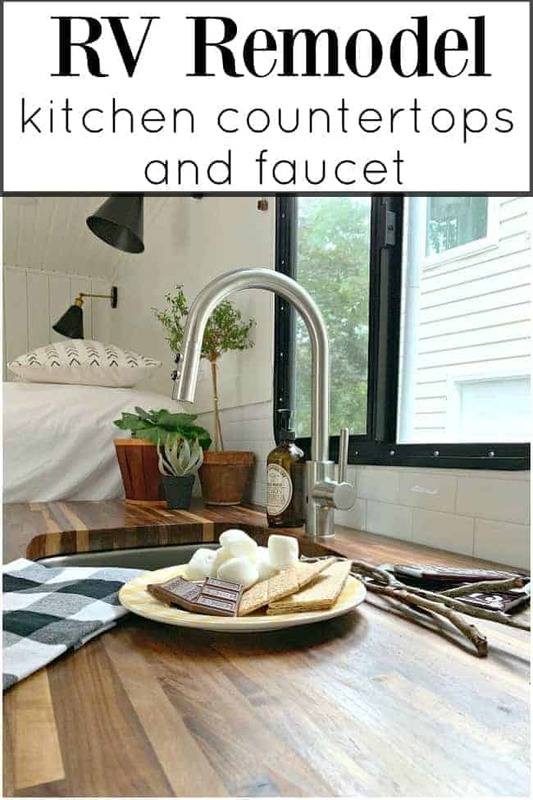 A beautiful space to cook and clean, i love the sink, countertop and faucet. You made some great choices and am anxious to see the bathroom. 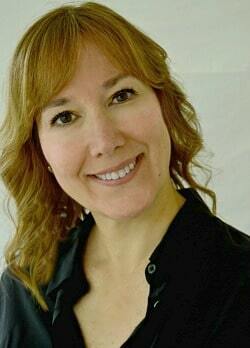 Thanks so much Marlene! I’m excited to get it all done so I can fill it up with our camping supplies. The bathroom is coming along. It’s a complicated tiny space so it’s been a stop and start kind of project. I’ve been sharing updates on Instagram Stories if you care to follow. Thanks for following along and for all of the encouragement. I love the way the kitchen area turned out and I agree undermount looks good! When we bought our house back in the 70s we replaced the metal cabinets, sink, and faucet in the kitchen. After my husband did some research we bought, at that time, a Price-Pfister faucet. I just recently replaced it because it was leaking and when my son opened it up it was all corroded. Since I thought we had a good run with the original of more than 40 years using it with a family of 4, I bought another Pfister faucet. I didn’t get as fancy as you, but I did buy one that had the nozzle that you pull out to spray. I would say you made a good choice from my experience and they definitely have a good reputation. Can’t wait to see the bathroom! Wow, 40 years for a faucet is great! You’re right to go with what’s worked for you for so long. So far we are loving our new faucet. There won’t be a sink in the bathroom (no room!) so it will definitely get a lot of use. Such a nice faucet Minnie has. Nicer than the one in my house. I hope to replace mine soon and have been looking at the Pfister brand as well as others. So many choices ….. 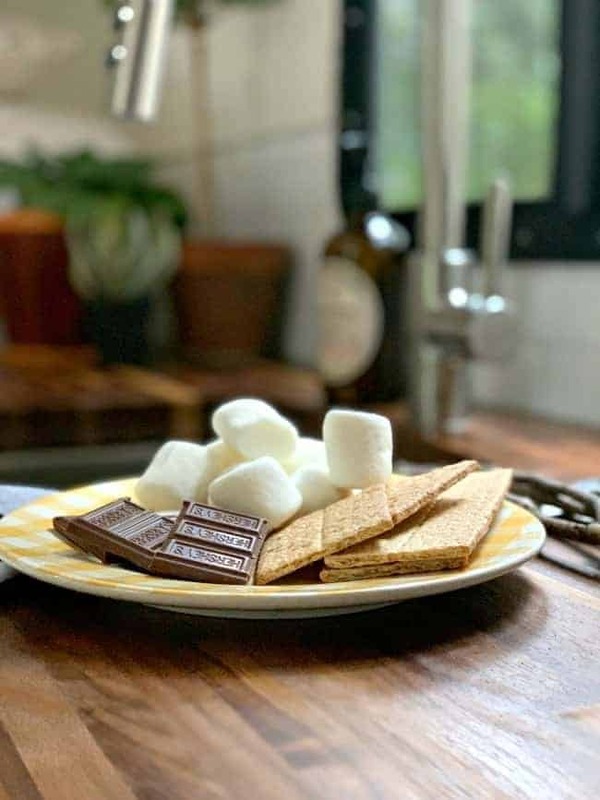 Your countertop is beautiful. A lot of hard work has gone into this little space already. You and your husband should be so proud of what you’ve done. Rome wasn’t built in a day, and obviously neither was Minnie. Thanks so much Pat! 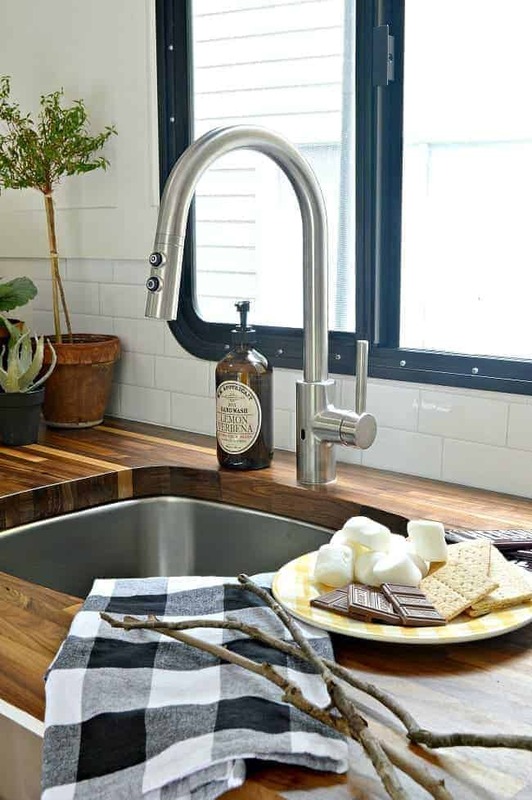 We’re really loving the new Pfister faucet. It’s the only sink, no bathroom sink, so it will be used a lot. You can’t go wrong if you decide to go with Pfister. I highly recommend them. Beautiful! It’s one of my dreams to buy a used RV, renovate it, drive it all over the USA for a couple of years and then sell it now that I’m retired. Your countertop & faucet are beautiful, and I really appreciate your saying 2 weeks and 9 coats. It helps me make a realistic estimate for my new wood kitchen counter in my ongoing mostly DIY kitchen reno. Thanks so much Laura! We would love to travel around in an RV for a couple of years too. We’re not quite there yet but it’s something we talk about often. I’ve never finished a wood countertop before so I did a lot of research before. It’s not hard but it does take a lot of time (most of it was time spent drying between coats). Good luck with your kitchen reno. 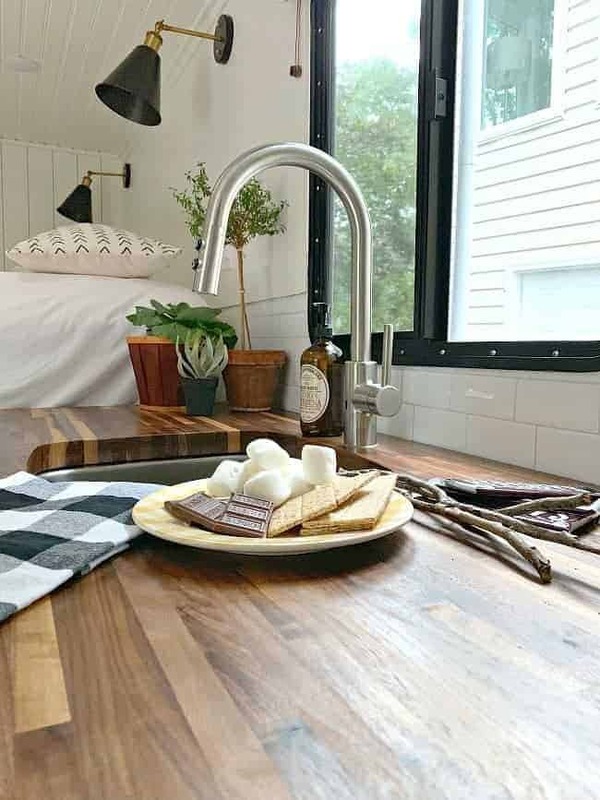 I’m sure you’ll love your new wood countertop once it’s done. Beautiful countertop Kristi. A lot of hard work but the results are gorgeous. I really like your new counter top. The color is amazing and the wonderful storage you have added will come in handy! The faucet is so nice! Good job! Thanks so much Dolly, I appreciate it! I’m loving the new kitchen area and excited to get it finished so I can fill it up with our camping supplies. Well done, Kristi! It’s coming along beautifully. I’m thinking of renovating a caravan once I’ve completed our house and everything you’re doing is very inspiring. Why couldn’t you use a ceramic sink??? 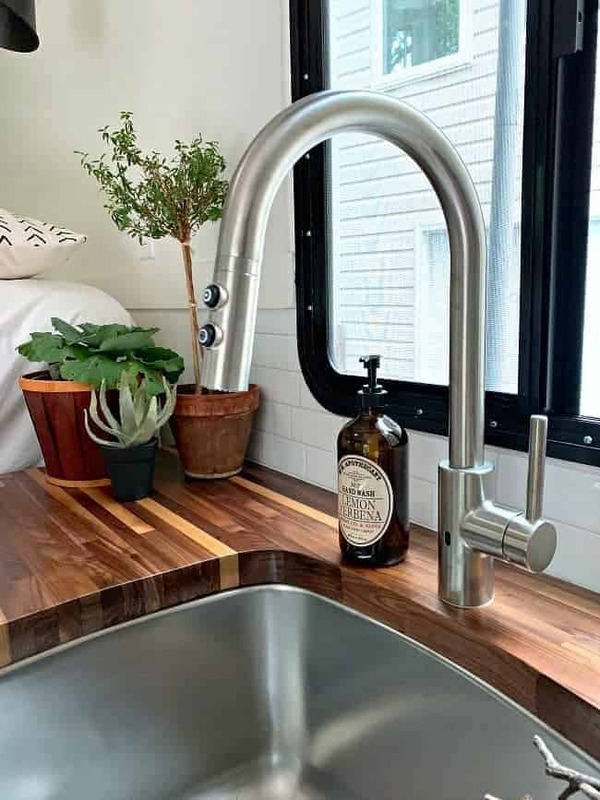 I really wanted a ceramic sink but we have to consider weight (not adding too much to the RV). Ceramic sinks weigh a lot and there’s always a chance of it breaking with the movement of the camper. I agree — the countertop and faucet are a perfect fit for Minnie. They are beautiful and would compliment any kitchen, home included. I love the deep basin. Can’t wait to see the shower. Thanks so much, Mom! The kitchen area is coming along better than I’d hoped. Now we just need to finish up the cabinet and walls…and trim. Alot of little things yet to do.